The Heavens Are Telling (from The Creation) composed by Franz Joseph Haydn (1732-1809). Arranged by Hal H. Hopson. Choir Sacred. 2-Part Choir; Unison Choir. 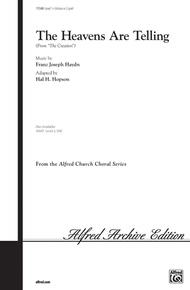 Choral (Sacred); Choral Octavo; Masterworks; Worship Resources. Ascension; Children; Classical; Fall; Masterwork Arrangement; Sacred; Spring; Thanksgiving. Grade 1. Choral Octavo. 8 pages. Published by Alfred Music (AP.11548).